Daniel Bryan is in the ring with the SmackDown Women’s Title belt. He talks about the upcoming 6-Pack Challenge for the title at Backlash and introduces one of the women competing: Becky Lynch. Becky says winning the title would mean everything to her. It would make it all worth it. Natalya interrupts Becky’s speech and heads to the ring. She’s not happy. SmackDown Live was supposed to be hers, but she has to share space with Becky. Alexa Bliss follows Natalya into the ring and wonders about some things. Carmella follows next, introduces herself, and starts talking about Nikki. Becky laughs as Natalya, Alexa, and Carmella all start arguing. Natalya suggests that she, Alexa, and Carmella are being manipulated by Becky into arguing, so the three of them face off against Becky. Naomi and Nikki run to the ring to support Becky and a small brawl breaks out. Natalya, Alexa, and Carmella end up leaving the ring and backing away. Dean Ambrose ads a lot of sugar to some guy’s coffee. The Miz (with Maryse) approaches Shane and Daniel. He’s not happy with having to defend his title against Dolph Ziggler. Daniel insinuates that Miz is a coward for backing away from Ziggler last week. The Miz says nothing. Good match. Crews seems to be getting more comfortable in the ring as time goes by, and he’s not trying to do too much. This was a solid match. Ziggler has Miz’s title belt after the match. He sets the belt down in the ring and dares Miz to come get it. Wisely, Miz sends Maryse in to get the belt. Renee Young asks AJ Styles about Ambrose and shows a clip from when Styles got crotched on the top rope last week. Styles is angry and threatens one of the backstage crew. Clips of American Alpha and their path to the semifinals of the tag title tournament. Charly Caruso asks The Usos about American Alpha. They respect American Alpha, but they’re going to remind everyone that they still run the tag division. Bray Wyatt talks about survival of the fittest and the evolution of mankind. The apex predators from long ago are no longer powerful. At Backlash, predator becomes prey. Good match. The main story I got from this match was the burgeoning feud between Nikki and Carmella, though all of the women had moments to shine (even if briefly). For the babyface team, Naomi started, Becky was in distress, and Nikki was the hot tag. The heels all took turns in and out of the ring. I would have liked to have seen less of an emphasis on the Carmella/Nikki story because it makes me think that one of those two win win on Sunday. But maybe I’m just thinking too much. Not much of a match, but the surprising quickness of it was interesting. 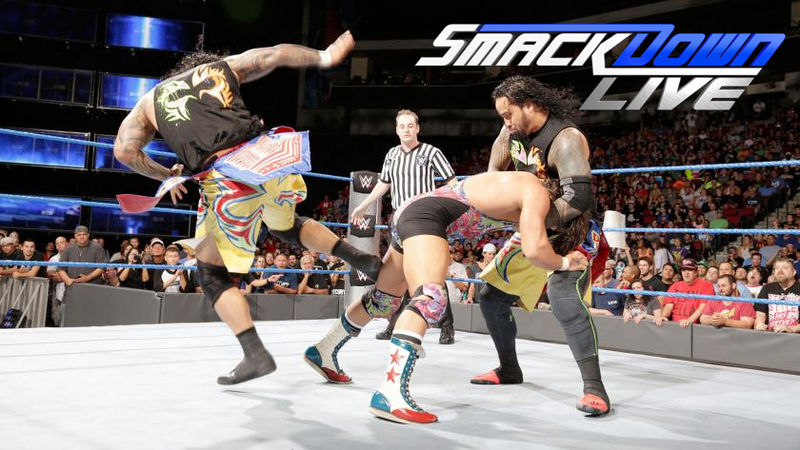 After the match, The Usos attack American Alpha and try to injure Gable’s knee. Charly Caruso asks Randy Orton about his strategy on Sunday. In response, Orton tells a story about a man, a rabbit, and a snake. Fandango brings a lady into the ring. He tries to show her how to dance, but when she starts doing her own thing he accuses her of being a liar. He excuses her from the ring and asks for someone else to dance with him. Kane heads to the ring. Fandango receives a chokeslam. AJ Styles breaks a guy’s phone. Curt Hawkins tells his GPS where to go. Ghosts are reported to have had… Curt Hawkins sightings. Forest fires worry about the spread of… Curt Hawkins. An okay match. It was pretty short and the ending wasn’t very dramatic, but it was fine. Renee Young says that American Alpha’s status in the tournament is in question. The Usos walk up and say that things feel different now. They’re angry about other teams getting more fan support even though they’ve been working hard for years. They’re done trying to earn respect. Dean Ambrose heads to the ring, and AJ Styles follows after. Charly Caruso starts to moderate, but Ambrose asks her to leave. Ambrose then gives Styles a gift: an old bowling trophy. He explains that it’s the only trophy Styles will ever get from Ambrose. Styles says he is not a joke, then Ambrose shows footage of Styles being crotched on the top rope last week. Styles does not find it funny. He reminds Ambrose that he took John Cena’s headband as a trophy after he beat him clean. And Ambrose is no John Cena. Ambrose agrees that he’s not Cena and says there’s no trophy for “the face that comes in second place.” Styles kicks Ambrose in the balls and breaks his trophy. An okay show. I thought the thing with The Usos was the most interesting. The Styles/Ambrose thing almost felt like an afterthought, but it did what it needed to do. There wasn’t a lot to choose from this week, but I did like this match. Hopefully Miz can maintain the interest he’s built in the last few weeks, and hopefully Crews can keep improving like he has been.